Confused if Godaddy or Inmotion Hosting is better? In this Godaddy vs Inmotion Hosting comparison, we have compared Inmotion Hosting and Godaddy web hosting services on different parameters like web hosting performance, server up time, time to first byte, customer support, and their plans and features. So let's start with the Inmotion Hosting vs Godaddy web hosting comparison. Godaddy and InMotion hosting , both are very well known hosting companies and have been providing their services for over two decades now. Godaddy was founded in the year 1997 closely followed by InMotion hosting which started providing its services in the year 2001. Godaddy and InMotion both along with hosting, also provides domain registrar services. They have a wide range of plans which you can choose from. The hosting plans found on these websites are pretty cheap as compared to other web hosts out there but if you need to choose the best value for money host among these two you will have to consider your needs and budget. To make your task easy, we have listed a complete list of all the cheapest plans these web hosts provide and the features that comes along with them. So let's start Godaddy vs InMotion Hosting comparison. The plans and features provide by both the hosts are a good way of comparing their credibility. Both Godaddy and InMotion have different plans in their shared hosting section which users can choose according to their needs and budget. To get a best insight of all the plans and features provided by both hosts let us compare their plans and features side by side. Starting with Godaddy, it has its most basic and cheapest plan named as Economy. Going by its name, its price is also minimal and only $1 per month. This plan provides hosting for one website along with 100GB of storage space and unlimited bandwidth. It also provides free business email for the first year. If you choose to buy the annual subscription you will also get a free domain. InMotion’s most basic plan is named Launch and it costs $6.39 per month. It gives you unlimited disk space and unlimited bandwidth and can host up to two websites. These both plans are for the most basic websites which have minimum traffic and load. If you are a beginner these plans are best for you. 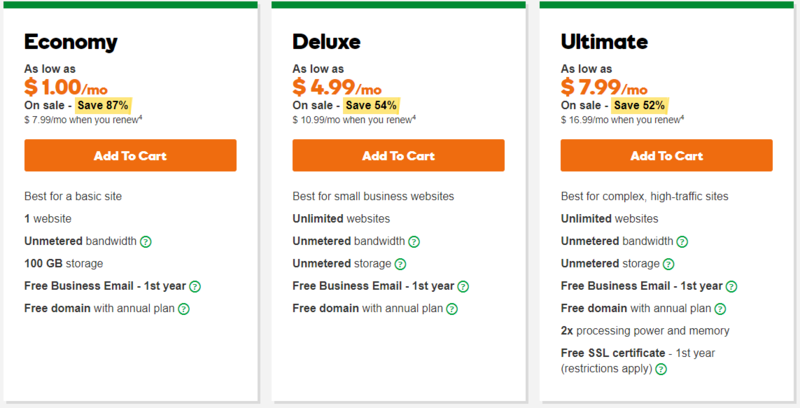 Second plan of Godaddy is named Deluxe and costs around $4.99 per month and provides hosting for unlimited websites with unlimited bandwidth and unlimited storage. You also get free business email for the first year free domain if you buy the annual plan. InMotion provides its Power plan for $8.49 per month which provides unlimited disk space along with unlimited bandwidth and hosting for up to 6 websites. These both plans are most suitable for small websites with less amount of daily traffic. Last plan of Godaddy is named Ultimate and is truly the ultimate plan. It costs just $7.99 per month and gives unlimited websites, unlimited bandwidth, unlimited storage, free SSL certificates for the first year and a free domain also if you buy the annual subscription. InMotion has its Ultimate plan priced at $14.71 per month which provides unlimited storage along with unlimited Bandwidth and can host unlimited websites. People owning websites with moderate to heavy traffic acquiring websites can use this plans. Comparing the plans of Godaddy and InMotion, we can see that both of them are equally good when compared to other hosting providers but considering the price, Godaddy has better value for money than InMotion. So in Godaddy vs InMotion Hosting price comparison, Godaddy is a clear winner. With cheap prices, generally, the performance of the host is downgraded. Therefore before buying any hosting plans from any web host always perform a website performance test as it helps to determine the overall performance of the host. Performance test usually measures the page loading speeds and the ping timing from different servers. Lower ping times are very important for faster loading of the website. Here we have compared the performances of two website, one hosted on Godaddy and the other hosted on InMotion hosting. Let's compare Godaddy vs InMotion Hosting performance. The performance tests show that Godaddy secured a C page speed score with a full page load time of 7.7 seconds with a total page size of 1.28 megabytes whereas InMotion hosting got a F grade with a full load time as 35.0 seconds for a page size of 3.76 megabytes which is too much slow as compared to godaddy. 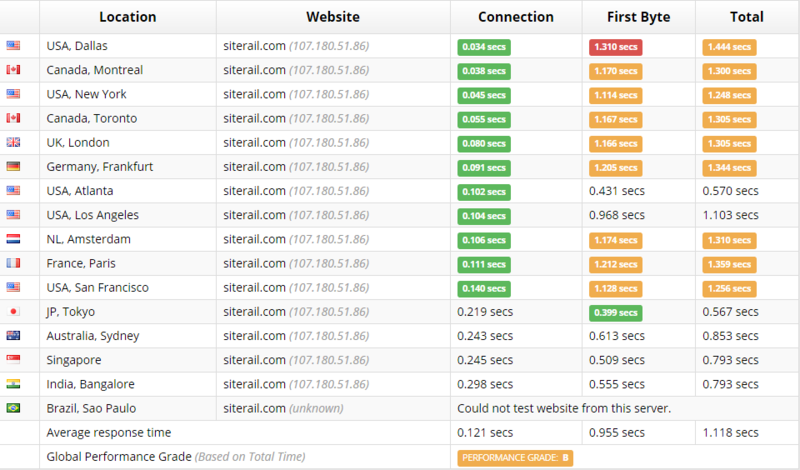 So from the performance tests we can easily conclude that Godaddy is the clear winner here. Time to first byte refers to the time taken by the server to get the request from the user, process it and then send the first byte of data back to the client. The lesser the time taken for the TTFB the faster will be the website loading speed. TTFB is a very important factor for web hosts as it helps to determine the website opening speeds statistically for the average user. A slow TTFB result can show that either the website is poorly optimized or the server itself has delays in the request receiving and sending part. You wouldn't want to invest your money in a web host which does not provide you good speeds. Here we will perform a TTFB test on two websites. One hosted on Godaddy and the other one hosted on InMotion hosting. Let's see Godaddy vs InMotion Hosting time to first byte comparison. ​As we can see from the results that both the hosts secured a B grade in the TTFB test. Though InMotion hosting managed to get a lower First Byte time on most of the servers, it failed to get similar results on some of the connections such as the ones made from India, Singapore and France. 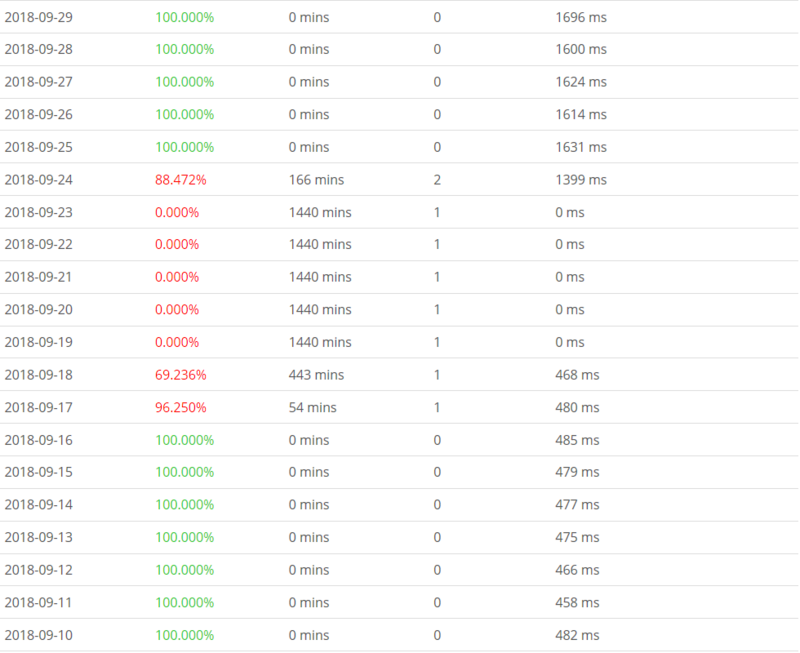 Godaddy got a very high time for the First byte for the connection made from USA but it managed to get a respectable score from other server locations. So from the statistical data we can say that both the hosts are somewhat similar as far as the TTFB time is considered. Uptime is yet another important factor that affects the quality of a host. Uptime refers to the period of time for which the web host was online and was serving the user requests normally without and downtimes or complications. While choosing a web host it should be kept in mind that never choose a web host with a bad track record of server uptimes. Frequent downtimes are an indication of bad server management. Though technology is never 100% fail proof, so minor downtimes are understandable but make sure to check that the overall uptime percentage should be more than 98% and the downtimes should be for as little time as possible. 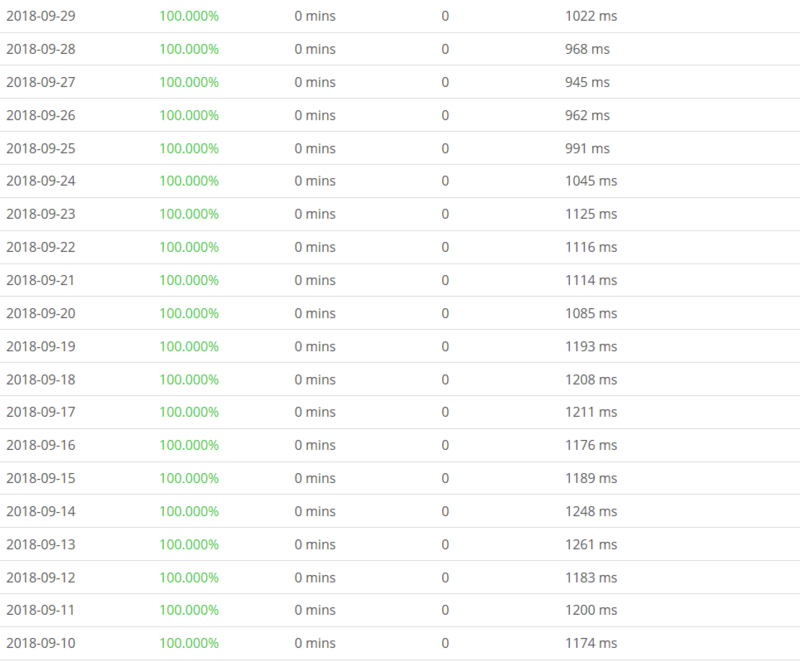 Here we have posted the uptime details of Godaddy vs InMotion Hosting for the past few weeks. The uptime reports of both the hosts show their uptimes for the past 5 weeks. Where godaddy did not have even a single instance of facing downtime, InMotion hosting has faced downtimes on 9 different occasions. During the period of 19 september 2018 to 24 september 2018, the InMotion hosting server were completely offline with 0.00% of uptime. This means that all the websites hosted on their servers were inaccessible for these 6 days. This is a very serious issue for website owners who have a huge user base and completely rely on their blogs or websites for their businesses. Such huge downtimes can drastically affect the website owners as well as their users. 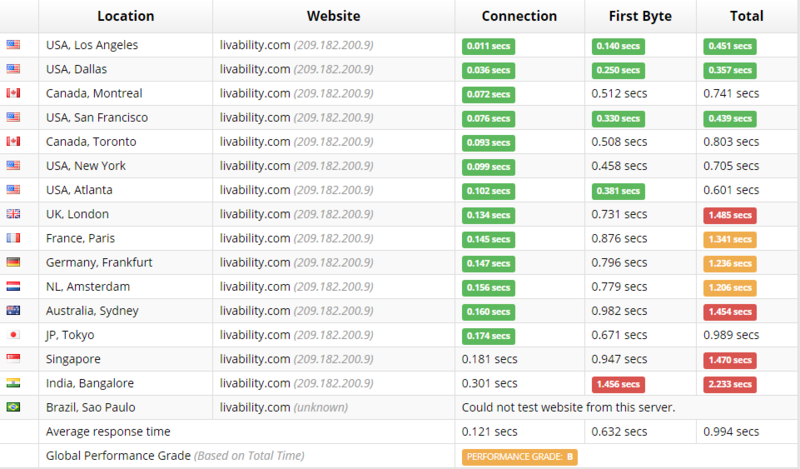 From these results we can declare that Godaddy is the choice you should go far if you don't want unexpected downtimes. Customer support is a very important aspect while choosing a new web host for your website. Many people tend to overlook customer support in exchange for good plans and offers and later on struggle to get the best out of their hosting. A good customer support is must and should never be compromised upon. Faster issue resolving, 24/7 technical support are some such factors which you should look for while buying a plan from any web host. Godaddy and Inmotion, both provide good customer services. Let's compare Godaddy vs InMotion Hosting customer support. Talking about Godaddy, it provides 24/7 support, both technical and general in multiple languages including the local regional languages. You can contact Godaddy customer support team via ticketing system, live chat, email or you can just contact them via a phone call and get your issues resolved. 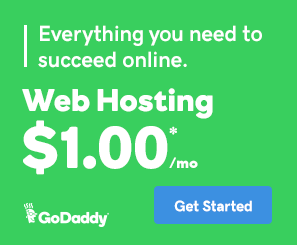 Godaddy also allows you to pay for your hosting in your local currency which can be a huge advantage for people who are not able to pay in dollars. You can also use the Godaddy community forums to get your issues resolved. Similar to Godaddy, InMotion hosting also provides 24/7 technical support in multiple languages. You can contact them via live chat, phone call, email or through ticketing system. You can also use the huge FAQ library of InMotion hosting to resolve your issues on your own. The community forums are also a great place to get help from fellow customers and get your issues solved at the earliest. Considering all the factors such as plans, pricing, service quality, uptime and help & support, we can say that Godaddy and InMotion hosting both are very good hosting websites that provide good quality hosting for affordable prices. If you are to choose from these two web hosts, your choice will surely boil down to your own personal preferences. So this was the Godaddy vs InMotion Hosting comparison, hope you have liked it.